On Sunday we had friends over to watch the football games. I made a big pot of chili and Josh made his favorite Queso Dip. Good food and football go hand in hand at our house:) Unfortunately, Josh’s team, the 49’ers, lost, but at least his Queso Dip was a winner. This easy cheese dip is perfect game day food. You really can’t go wrong with a big bowl of melted cheese and salty tortilla chips. Mmmmm! 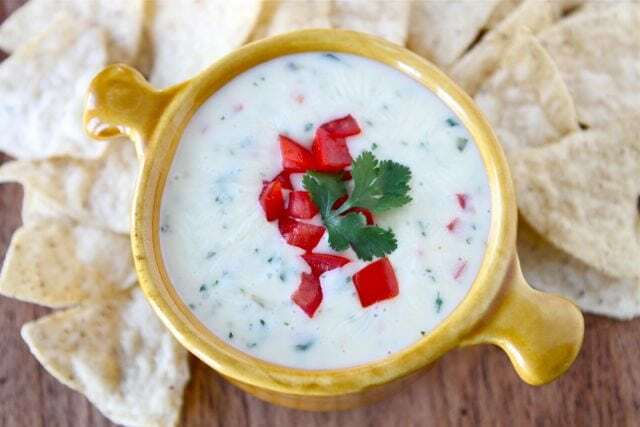 There is nothing complicated about this Queso Dip. The dip takes 10 minutes tops to make, which makes it perfect for parties. You can reheat the cheese in the microwave, but if you are going to serve this Queso Dip at a party, I highly recommend you serve it in a crockpot so you don’t have to worry about heating it up again and again. The crockpot will keep the cheese melted and smooth. The dip isn’t spicy, but has a nice flavor. If you want a bit of a kick, you can add an additional jalapeño or a dash of hot sauce. So I guess we are looking at a Patriots vs. Giants Super Bowl. Who will you be cheering for? I am still undecided. 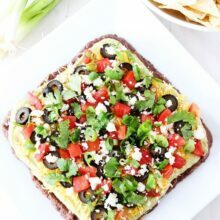 Josh is cheering for the Patriots, but I might have to root for the Giants to keep things interesting:) I do know we will be making this Queso Dip for the big game. It is a must for Super Bowl Sunday. 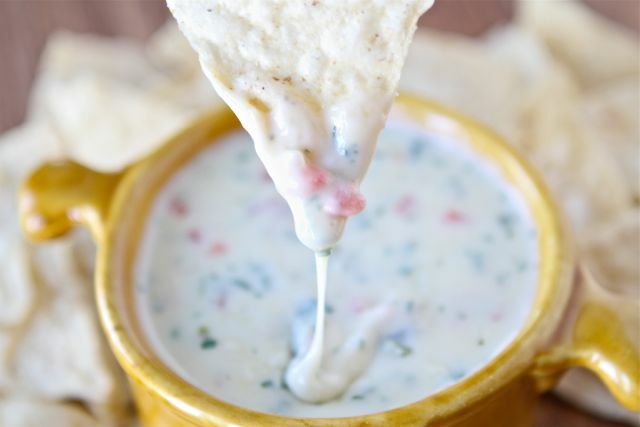 Make sure you add this Queso Dip to your Super Bowl party menu. It is sure to be a hit on game day! 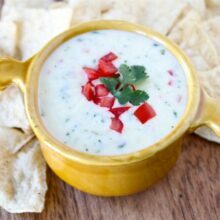 Easy cheese dip made with white American cheese, Pepper Jack, onion, jalapeño, poblano pepper, cilantro, and tomato. Serve with tortilla chips. Heat canola oil in a medium sauce pan over medium-high heat. Cook the onion and jalapeño pepper until softened and reduce heat to medium-low. Stir in the roasted poblano pepper. Add the shredded cheese and milk. Stir until mostly melted. Stir in the tomatoes and chopped cilantro. Serve with chips immediately. Note-if you plan on serving this at a party, you may want to serve it in a crockpot so the cheese stays melted. I want to skip football and just have this dip. YUM! This dip looks sinful and absolutely delicious!! I can’t wait to make it for our superbowl party. We live in Boston so we – of course – are huge Patriots fans! GO PATS! So much better than velvetta and rotel! I’m a huge fan of cheese dip, I love the use of white cheese. Right up my alley, for sure. Perfect game food! Maria!! !this is beautiful!!! Queso is one of my favorite foods in the wHole wide world!!! Absolutely making this on Sunday! 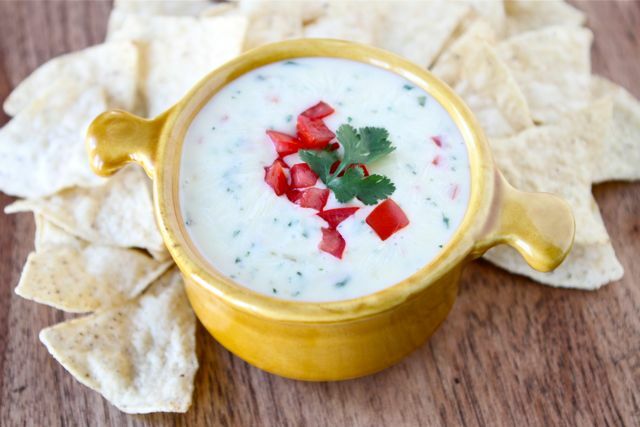 ooooooh queso…a huge favorite of mine! i’ve never made a version other than the velveeta+rotel kind, but this looks so easy and sounds so much better! This would be a fun Super Bow recipe. My boys love queso dips. I love that this uses real cheese–looks like a winner! This looks so good that I want to go make it right now…for breakfast! I’ve never made it, but I love this stuff! We are Saints fans here (that loss to the 49rs killed me), but I am kind of excited about a Patriots/Giants rematch, since the last one was such a good game. I love Queso dip, but never made it. Theonly kind I made was velvetta cheese and salas! 🙂 I am so going tomake this! I could eat this whole bowl by myself! you had me at the word, dip. be still my loving heart! looks amazing! This looks so delicious! Queso is a must have appetizer during football games in our house! Who will I root for in the Super Bowl? Well, believe it or not, I plan to root for the Patriots despite the fact that they beat my Ravens in the championship game last Sunday! I would watch the Superbowl (hate, hate, hate football) just for this dip! I totally need to try this asap! I love, love queso dip! oooo snap! definitely need to make this for super bowl parties. ooor any other day of the week. Looks delicious! As a displaced upstate New Yorker, I’ll be rooting for the Giants! My husband is a huge queso fan. I love that this doesn’t look so thick and sludgy as some…will give it a try! So yummy! I think I will make this to go homemade pretzels! I had something similar to this dish combination at a pub recently and it was to die for! Can’t wait to try it at home now! Thanks for sharing the recipe! I want this dip for lunch today! It looks delicious!! Your description says “white cheddar” but your ingredients call for “white american.” Do you mean “white cheddar” in the ingredients? This sounds wonderful (as do all of your recipes)!! love seeing queso dip not made with velveeta! 🙂 i think this needs to make an appearance at our super bowl party too! I’m not that cooking savvy. How do I roast a poblano pepper?? Thanks. Place the poblano pepper under the broiler and roast until it is black. Let the pepper cool and then remove the black skin. You can also roast peppers on the grill or on a gas stove. I hope that helps! Awesome cheese dip. Will definitely be cheering on the home team (Pats) assuming we have nbc to see the game. This is making me SO hungry. I love melty queso so much. What a perfect game-day snack! My fiancé was also rooting for the Niners- he’s still so sad! Yum! Nothing beats a big bowl of delicious dip along with tortilla chips! This looks like the perfect addition to the Super Bowl party we are hosting! That texture looks UH-MAY-ZING. Yes I want some right now! Just chips and this dip for lunch! How does melted American taste. Is it like velveeta or cheddar? I am not a fan of american on my sandwiches but I wonder what the taste is like in a dip. I am intrigued. I don’t eat Velveeta so I am not sure of the comparison:) It is not a strong cheddar. It melts in nicely with the Pepper Jack and other flavors. Your queso looks amazing, I’m drooling! 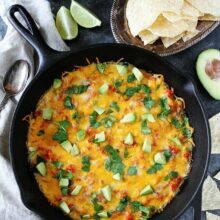 Definitely adding this to the superbowl menu! i had ice cream for dinner, but really want this now. This almost kinda sorta makes me wish I was going to a superbowl party this year! but instead I’m going to a four year old’s birthday party…I have a feeling this will be a hit there as well! Yum…I love that it’s not the typical velveeta (which weirds me out anyway) and RoTel. We’re having friends over for the Super Bowl and you have to have cheese dip! Thanks for the recipe. Looks awesome Maria. I am adding this to the Superbowl must makes! 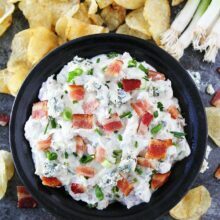 Husband will be at a Super Bowl party so might send this dip with him (or make it and eat it all myself!) Cape Cod girl, so GO PATS!! Looks delicious, I’ll be making it! Thanks. I can see why this dip is a winner! I just wanted to tell you both how much I have come to appreciate your blog. I guess I came across it about a year ago, but I have been reading it more and more and looking through the archives because I am looking for vegetarian inspiration. You have some really wonderful, affordable recipes that I think even I could make — no fancy techniques or tools required — and I so appreciate that. Thank you! Thanks for your kind comment! Thanks for following our blog! I am planning on checking through your archives for SuperBowl recipes. This dip looks yummy. I’m linking to this recipe on my blog. Please let me know if that’s not okay. Thanks! I make a dip almost exactly like this but with spinach in it. LOVE it! I am not a fan of cheese, but I have a friend who is obsessed with white cheese dip. I can’t wait to share this with her! This is pretty much the definition of creamy, queso-y goodness. I think I’ll just swan dive in it, no chips needed. The texture of this dip looks perfect for dipping. The ingredients sound so good with the american cheese. Made this over the weekend… DELISH is an understatement. I think its the new fave dip in my family. Thanks for sharing!! Glad you enjoyed the Queso Dip! I made this last night and it did not come together. The whole thing was separated. the cheese would not melt into the milk (I used the same cheese as you did and followed the instructions to a t). I had to end up adding flour to some of the separated milk in a separate bowl then stirred it back in and it finally came together. the only bad part was it was too thick now and tasted a little like raw flour. Do you know what i could have done wrong? Any suggestions because the flavor was great!? Thanks! I am not sure why you had trouble. The cheese should melt right together. We’ve never had an issue. Sorry! is there a way to make it thicker? looks too runny for my taste. You can thicken it with flour, but we like the consistency the way it is. 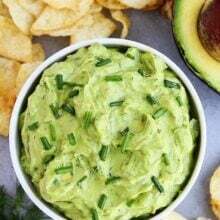 Football or not this dip is perfect for your next party! Pingback: 35 Game-Day Recipes « A Cedar Spoon. Here we are a year later, and this is still lookin’ good. 🙂 Thanks for a great recipe! I made this last night as a test before Superbowl. It’s amazing. Going to increase the recipe and finish off in a crock pot this Sunday. This dip is great. I’ve avoided american cheese in all my other attempts in the past, but you just can’t get the consistancy with out it. I made up a batch and thinned it out with a little extra milk and added macaroni to it, YUM!!! I must also add that I am in love with your blog, so many tasty tasy ideas. Made this last night and was right on point. I roasted the jalapeno when I was roasting the poblano pepper. I also did monterrey jack instead of pepper jack because I didn’t want too spicy. I had no issue with the cheese and milk coming together. In fact I needed to add a bit of extra milk because it was too thick I could barely stir it… but once I did, it was perfect. It’s not often I will give =any= recipe five stars, but this one deserves it in the appetizer category. My 12-year-old cousin, who is quite the queso aficionado, gave it high marks, which is what tipped the number of stars from four to five. We both agreed that for us, we could stand a little more heat, so the only adjustment for our tastes will be to add a tad more jalapeño next time we make it. I made this from the recipi, and milk got curdled. What should I do ?